After the redesign of ThePokerBank site at around May 2009, I noticed that there were a few sections that were not as in-keeping with the theme of the site as I would have liked. So, instead of completely wiping them from the site or trying to find them an appropriate home, I decided to do the manly thing and lump them in to this "archives" section. If you can't find what you're looking for, try searching the site using the search box. If that fails, contact me and I'll see if I can help. 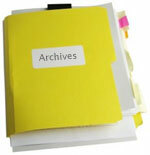 Try the featured content archive if you're looking for pages that used to be in the tabbed box on the homepage. Why have these articles been moved to this section? They are either out of date or don't fit in well with the rest of the site, that's all. I'm pretty sure that <1% of visitors to this site will actually ever make it to this section due to the fact that I hid the link to it at the bottom of the site, so I guess some sort of congratulations is in order for being a super-browser. I'm sorry that I can't offer a better reward than a bunch of older articles that have become the outcasts of the new design. You can always go back to the Texas Hold em home page and start from scratch to try and find something a little more worthwhile. I would recommend the strategy section myself, as that is where all the real gems of information hang out. Failing that, get some rakeback, play some poker and we'll pretend this never happened.